CD reviews: "Fresh Tracks" and "Harlem Blues"
These reviews first appeared in the March/April 1992 issue of Living Blues magazine. Both of these releases match a young white musician with a veteran black bluesman. While neither album approaches the Anson Funderburgh/Sam Myers partnership, Satan and Adam at least make a go of it. 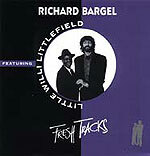 Richard Bargel's duo with Willie Littlefield falls flat, mostly because Bargel's vocal skills lie somewhere south of David Bromberg and Ringo Starr's. 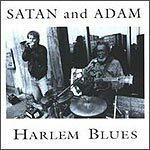 "Harlem Blues" came about when harmonica player Adam Gussow met one-man blues band Satan (Sterling Magee) while driving through Harlem. Gussow asked if he could sit in, Satan assented, and they began jamming together on a regular basis. Rough at the edges, "Harlem Blues" is nonetheless riveting. Despite the middle-class romanticism of it all, this album is remarkably free of pretension and, instead of the predictable angst-ridden sociopolitical commentary common to too many white blues artists trying to establish their cultural authenticity, we get a healthy shot of straight-ahead blues with a dash of jazz. A listen to the three standards covered here tells us everything about Satan and Adam we need to know  especially the broad range of vision and talent they bring to their music. "Don't Get Around Much Anymore," from the Ellington book, receives a surprisingly sophisticated treatment from the two street musicians. Satan's guitar playing has the smooth urbanity of Wes Montgomery coupled with the imaginative wanderings of Tuck Andress and tastefulness of Fenton Robinson. At the same time, Gussow's harp  playing the main melody line  is as slyly seductive as Papa John Creach's violin on his recordings of the same song. "Sweet Home Chicago" features a vocal duet from the two men on a contemporary-sounding version of this standard, owing more to modernists such as James Cotton and Muddy Waters than Robert Johnson. "C.C. Rider" is given a powerful, riveting presentation, and Satan and Adam show themselves to be unafraid to tackle a classic from a new angle. More importantly, they display a genuine musical empathy for each other that allows each to make the other a little better. Of the men's original compositions, "I Create the Music" is certainly one of the most listenable, with a heavy funk beat and catchy melody. Compared to the minimalistic packaging for Satan and Adam, Bargel's album is profusely illustrated, with lyric sheets and state-of-the-art production. Musically, though, "Fresh Tracks" falls far short of "Harlem Blues." Bargel and Littlefield never click and often seem to be playing against each other. An example: On a cover of "Lazy Bones," a vocal duet, their singing was not even in sync. To be sure, Littlefield's piano is stellar, exhibiting both technical prowess and tasteful restraint. But Littlefield is little better as a vocalist than Bargel, and Bargel is no singer. To be fair, Bargel is a fine slide guitarist who plays with verve and imagination. He is also a pretty good songwriter. But with the price of CDs being what they are, there are a lot of other albums one might purchase before this one.